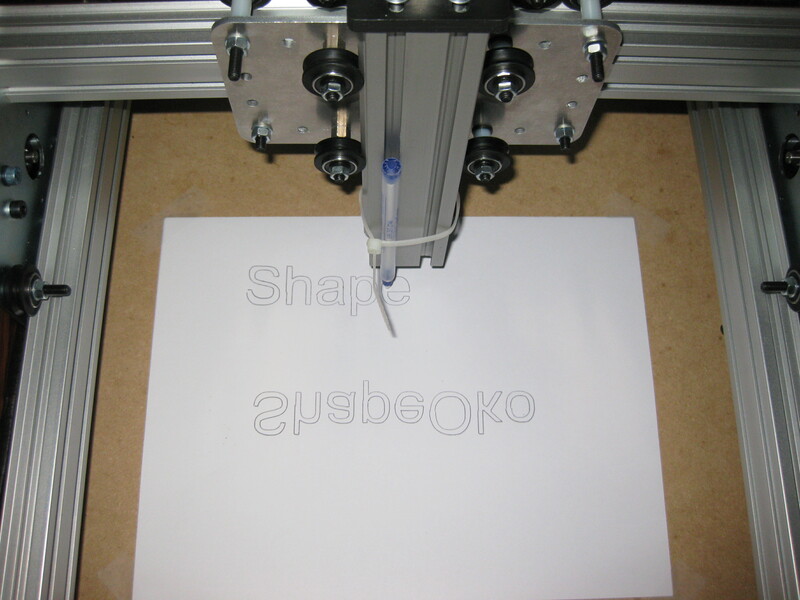 Naturally, this post is a follow-on to Shapeoko: Part 1 and Shapeoko: Part 2. 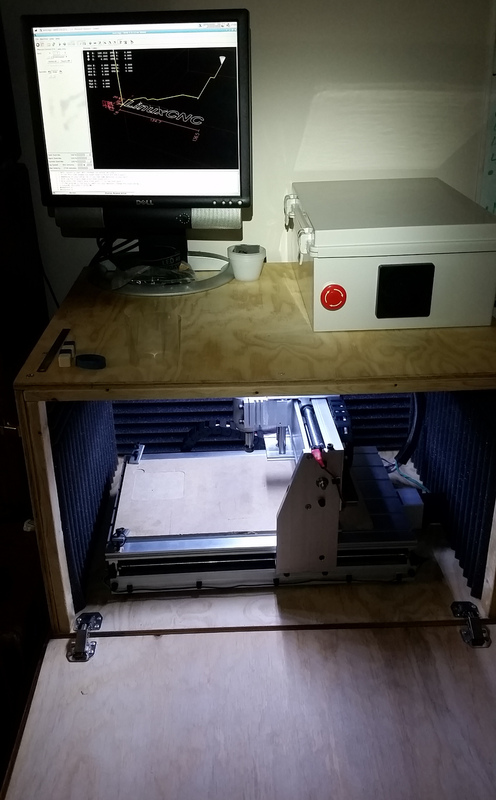 I’ve basically put the machine together now, and can move the X and Z axis around from the host computer, but still have to figure out belt attachments for the Y axis, and run the wiring in a sane way. I was holding up a microswitch to the various relevant spots for end-stops as I went, and everything but detecting the upper extreme of the Z axis should be easy. As in the last two posts, there is an assembly gallery under the fold. Another bit of progress on the CNC project: Better drive nuts! The design is attempting to avoid expensive, difficult-to-source, or chicken-and-egg problem machined parts. The biggest issues because of that policy come from the couplers which attach the lead screws to the motors, and the drive nuts which attach the axes to the lead screw. Because my leadscrews are 3/8-16 Unified Coarse thread, there isn’t a “proper” solution to the problem, as any professional mill would be using Acme or Ball threads for the leadscrews. Therefore it has been hobby engineering all the way on those parts. The current couplers (with which I am becoming ever more unsatisfied; they slip badly on direction reversals) are constructed by seizing a 3/8” coupling nut onto the end of the rod, drilling a 1/4” hole through the rod/nut assembly, and drilling and tapping a hole for a set screw into the side of the nut to grab the flat of the motor shaft. Because the frame won’t accommodate Lovejoy-type couplers (the canonical solution for such things), I suspect the eventual replacements may look something like the nested fuel line couplers this and other similar designs employ. I don’t like the lack of stiffness in those configurations, but things don’t appear to be tightly enough aligned for the inflexible couplers, and the slippage problem will be a show-stopper for actually milling with it. The old solution for the drive nuts was roughly-bent steel brackets, wrapped around coupling nuts. The theory was that the steel would be springy enough to pull things into alignment, and malliable enough to beat, bend, twist, or otherwise adjust the fit. In actual fact, no amount of adjustment could get them to align perfectly, and the springiness wasn’t enough to prevent them from contributing to the axes walking in their rails. That design was eventually abandoned, and no good alternative came to mind, so one of my collaborators and I performed one of the best techniques for mechanical problem solving; we wandered around a home improvement store until we found parts to make something that would work. The solution? 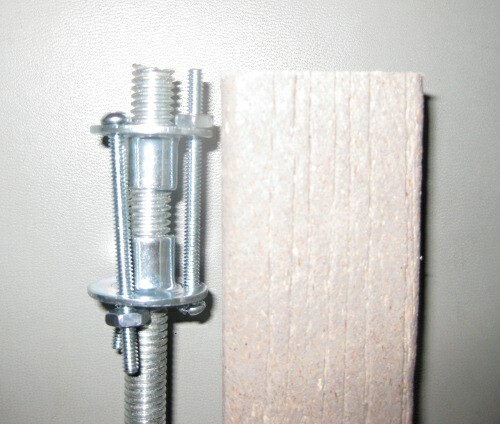 — Pairs of Tee nuts (the kind with screw holes, not tacks), attached together with machine screws (adjusting the tightness of the screws controls the preload, which gives free anti-backlash effects), mounted in blocks of Trex (A plastic/wood fiber composite material), which is cheap, easy to obtain, and works similarly to HDPE (Which is to say, wonderfully. Think soft, forgiving wood with no grain). These seem to be better than the old ones, and (possibly with a bit of shimming) workable for a usable mill. There is a fair amount of fiddly fitting and drilling to putting those together, but nothing too awful. The machine screws have been trimmed and the edges of the block dressed a bit with a file after the other one went together, so they look pretty solid. 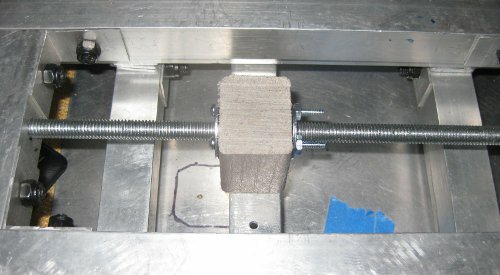 In addition to better nuts, the other good discovery is that I suspect that Trex will make excellent, low cost, easily available material to mill objects without any particular material constraints from once the machine is working, I just wish it didn’t have tacky looking faux-woodgrain molded into the stock. 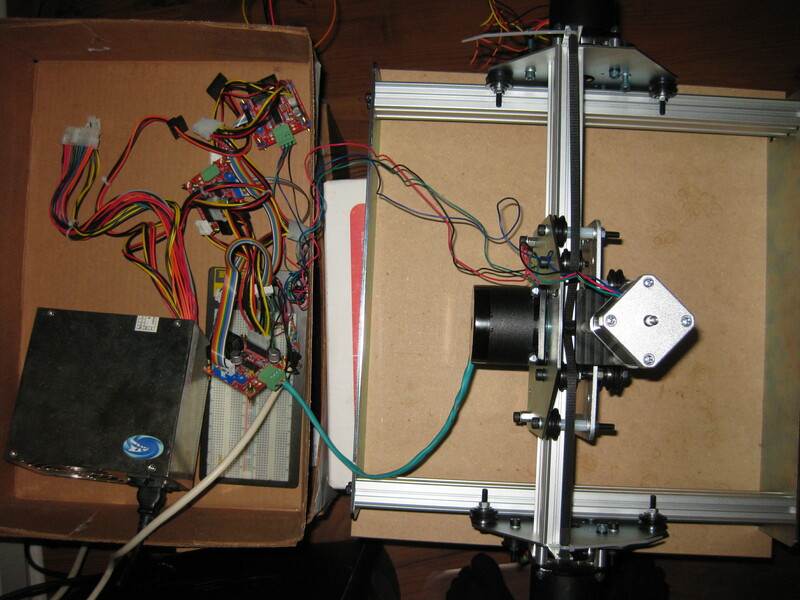 I got a set of RepRap Stepper Driver v.2.3 kits to use for my CNC project, and was having no end of trouble with them, but finally had a breakthrough that has two of the three working…and one definitely, definitely dead; the magic smoke escaped from #3. The trick: the SOIC packages were ever so slightly bent in shipping, and I was a little too conservative in the application of solder paste, so some of the contacts around the IC were intermittent. After I finally found it, which was a little difficult because the pressure of a test probe temporarily fixed the problem, all that was needed was punching down a couple pins with a hot soldering iron. With two boards working I’m now in business to finish off the XY table. Because I’m getting proud of it, a picture of the framing and drive for the XY table in the state it was in the other night. All it (just for the table) really needs mechanically now are the bolts attaching the lower lead nut assembly to the middle crossbar, and the table itself to be attached to the rails and lead nut assembly on top (need to pick up some short flathead screws to countersink in for that). To be safe it should probably also have the bearing assembly/leadscrew protector/encoder mount tubes installed where the floating brass nuts are in that picture. The workspaces in both images are noticeably horribly, horribly messy; both pictures were taken at the end of a couple hours of work, right before cleanup. I (unsurprisingly) tend to keep my workspaces compulsively clean. 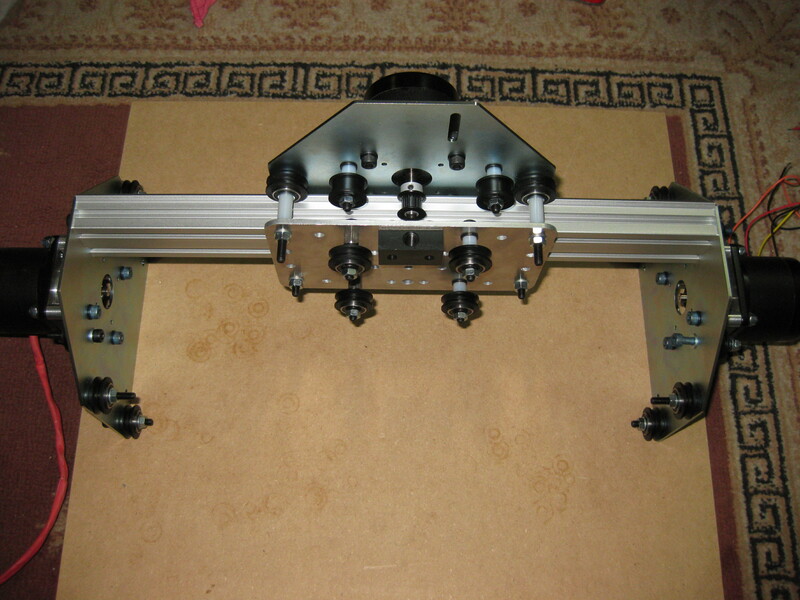 The motion capability will be 9” in the X dimension and 6” in the Y direction, the Z axis is on hold until after the semester is over, there just isn’t time to design it in now. One remaining problem is couplers for attaching the lead screw to the drive shaft, there are lots of options, but they all seem to cost at least $10/axis. I suspect unless something better appears I’ll end up with lovejoy couplings. 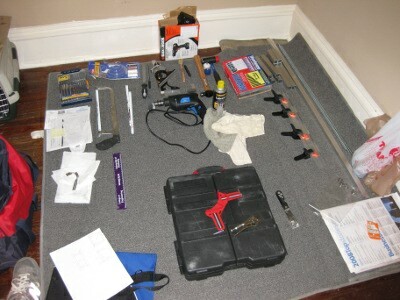 The framing will be assembled with bolts, tabs cut from 90deg angle stock, and a bit of epoxy to make it easier. The next big fuss is figuring out the driver circuits. 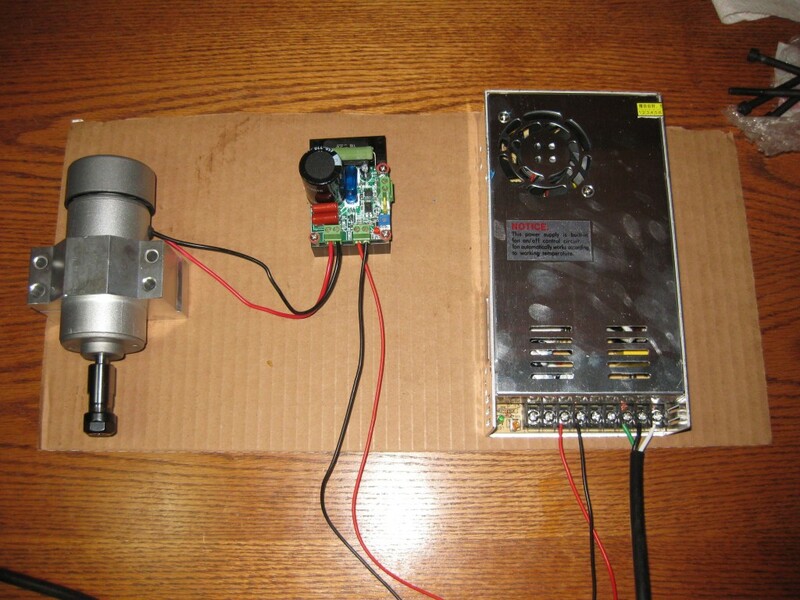 The motors are rated for 2A at any practical voltage, and only show about 2.6Ohms/coil of resistance, so its going to require proper current-controlled drivers, which may be expensive. The thing I’m liking most about this project is that I’m learning a huge amount of practical, hands-on knowledge about metalworking and mechanical devices in a hurry, in a low-investment environment so I can experiment and really get a feel for things. I’m not sure if I’ll ever do much more metalwork, but its a good skill to have.